It's E3 week, which means we've basically been living at the office during the festivities. After the madness that was Tuesday, we decided to take a little time out to unwind and play some videogames. Fancy that! We recorded the whole thing for your viewing pleasure. Enjoy! I am saddened youtube is blocked at work.... I guess I should be working..
Luigi's Ghost Mansion doesn't half get tense at times! Sorry about the sound on this, folks. There's no video here for me to view.....??? One of the most underrated games of last year. What a jolly game session, eh? ...all at various points. I was the Mario Chase KING in the maroon top. 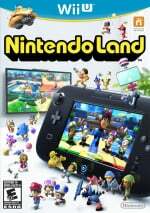 I love Nintendo Land, for a game I thought had no potential, it actually turn out to be alot of fun I love playing DK, Yoshi's and Link's mini games, I haven't played any of the ones that force other people to play too, unfortunately. Nintendoland is just awesome with friends !! What on earth was that ghost charge thing and what does it do? That was awesome, wish I could get 5 people together sometime. Nice i don't have the game so i like watching others play it, especially when you are so funny. Ah, sorry, I couldn't watch the video on my 3DS. Thanks for answering. Then again, I still long for the day when three friends and I would plunk $5 each into TMNT arcade just to best Shredder once again. Or when the living room would be packed with sweaty teenagers and smelly kids huddled around two controllers and a bowl of cheese puffs. I could go on and on, but sometimes I think back to the joy gaming brought to my childhood and wonder what this hobby is becoming.